The first of five Class 40’s and first overall yacht in the double handed divisions of this year’s Newport -Bermuda Race was Dragon, sailed by owner Michael Hennessy and Merfyn Owen, of designers Owen Clarke Design. Having lead for the second half of the race, Dragon crossed over from a position to the eastern side of the fleet to cover rivals Bolands Mills (John Ryan/Joe Harris) for the last day of the course. From having been out of sight the two yachts then raced the last eighteen hours at times watching each others head torches and trimming lights. Third across the line and again in sight by the finish was Cutlass (Alex Mehran/Nick Halmos) winner of last years Bermuda 1-2 and Halifax-Marblehead Race. Cutlass (ex 40 Degrees 1), the pre-race favourites based on the form book lead on day one taking a more easterly route. She suffered damage to her mainsail mid way into the race that necessitated repairs with the sail down on the deck for a considerable time. The Newport-Bermuda Race, for those who’ve not taken part is raced in a variety of conditions and is a challenging event, both physically and mentally. It’s a true ocean race across nearly six hundred miles of the North Atlantic, out of sight of land for 95% of the course and depending on the year, subject to winds from flat calm to storm force. It’s no warm weather cruise and for the sailor who’s looking for something different in which to compete either in their own boat, a friends or by chartering it comes highly recommended. The start at Newport Rhode Island is organised, comfortable and entertaining as you’d expect from the former home of the Americas Cup. Race Headquarters are at the New York Yacht Club and for the preparation period our boat, Dragon was based downtown at the Newport Shipyard in the same marina as our larger twin rudder cousins, Speedboat, Titan and the Puma Volvo 70. Phase one of the race is out to the US continental shelf lining up for, and then getting into/through the first of the Gulf Stream eddies (cold and warm eddies are rotating volumes of water that flow in opposing directions with the same effect on racing yachts as ebb and flood tides). The water is cold, in the low sixties (Fahrenheit) as it comes down from Greenland, flowing past Nova Scotia and along the North East coast of the United States. The result is wind sheer, potential fog and a relatively cool first night. Get this wrong and you can find yourself in 0.5kt to 1.5kt adverse current while your competitors enjoy neutral or positive current taking them to the next phase. The sailing on this leg was straight forward this year, fast and with the occasional whale and dolphin pods to distract and awe Mike and I. Having hopefully got the nav/strategy right (and Mike did) one arrives at the north wall of the stream in the correct position to cross over. The north wall is typically marked by rapidly rising sea temperatures, an agitated sea state caused by wind and current colliding and occasionally violent thunderstorms created by the rising air off the warm water. This year there was a huge meander (like an ox-bow bend of a river) that provided those boats that found it a further boost to the south-east along the course to Bermuda of up to four to five knots, with water temperatures of over eighty degrees. Finding and staying in this as long as possible was a must if you hoped to win in this year’s race. There’s plenty of talk on the dock afterwards of disappointing results founded partly on being slightly to one side or another of local effects. Although positions are widely reported on a variety of prediction models, no two agree precisely and the differences in the position and nature of the main stream and eddies can be surprisingly marked. That’s another challenge that this race imposes unlike the fairly well known and documented ebb and flow of say the English Channel tides. It can be like navigating the Alderney Race or Portland Bill without a tidal atlas! We found this out in phase three. Unlike the rest of the Class 40 fleet we elected to ride the stream a little further east and exit as the most easterly boat. We had a reasonable lead at this point and felt we could extend it further to give ourselves a comfortable cushion. Mike had done his homework as always with the same enthusiasm and attention to detail that he had put into the preparation of the yacht itself. We had also sailed the course three weeks before and from a list of eight models he’d researched we found a Gulf Stream models we had faith in. Phase two using the most updated version of this model along with real-time data that was available went perfectly to plan, but the 1kt boost we expected to the east of a cold eddy south of the main stream turned out to be a one knot header for a good eight hours. We weren’t dismayed, the boats to our west we reckoned must have the same or worse (positions were delayed four hours by the race organisers). Dragon crossed back west to cover the second placed boat in the class and that’s where we ‘bumped into’ Bolands Mills (third, Route du Rhum 2006), whose formidable crew kept us up and on our toes all night. It was only in the bar afterwards at the Royal Bermuda that we found that the competitors eight miles to our west had enjoyed almost a knot of current with them for much of the same period. Which brings us to the finish, ah the finish. Is there a better place to arrive after four days at sea eating freeze dried and alternately wearing dry suit top/boots or baking while trimming under clear blue skys? Perhaps, but I haven’t been there yet. This is my fourth trip to Bermuda and I don’t think I’ll tire of it. The welcome is great, the island’s people are genuinely hospitable and it has fascinating history, rum (after all it’s raison d’etre for most of it’s history was as a base for the Royal Navy), and understands how to host a race finish. Oh yes, did I mention a major sponsor of the race is Goslings, the rum that goes into the original dark and stormy? 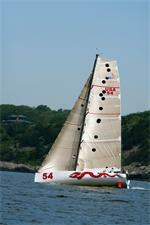 Races to Bermuda happen every year from the East Coast of the USA. The most well known of them alternate biannually. This year it’s the Newport-Bermuda. Next year it’s the Bermuda 1-2. I’ve competed in both and they’re ocean racing classics that merit going on your list of events to do before you die. To the European or Southern Hemisphere sailor they may not have the same kudos as the Fastnet or Sydney Hobart, but don’t be mistaken, you are truly crossing a patch of ocean when you do this event. This year the max wind we saw was 28 knots, the minimum zero. Can you imagine what it would be like to be three hundred miles offshore in the Gulf Stream with forty knots of wind against a four knot current? Well, toughen up, rum and sunshine will be only thee hundred miles away!